Do I really need to write a summary for Guillermo del Toro's Pacific Rim, other than "stuff blows up good"? This big-budget production kind of floundered at the domestic box office just a few short months ago, in spite of several factors that usually mean big bucks: fantastic visuals, a paper-thin plot, big robots, bigger monsters and, of course, a PG-13 rating. All this, and Pacific Rim was even helmed by a respected filmmaker who's tackled everything from popular adaptations of oddball comic properties (Blade II, Hellboy) to award-winning dramas laced with fantasy and horror (Cronos, The Devil's Backbone and Pan's Labyrinth). 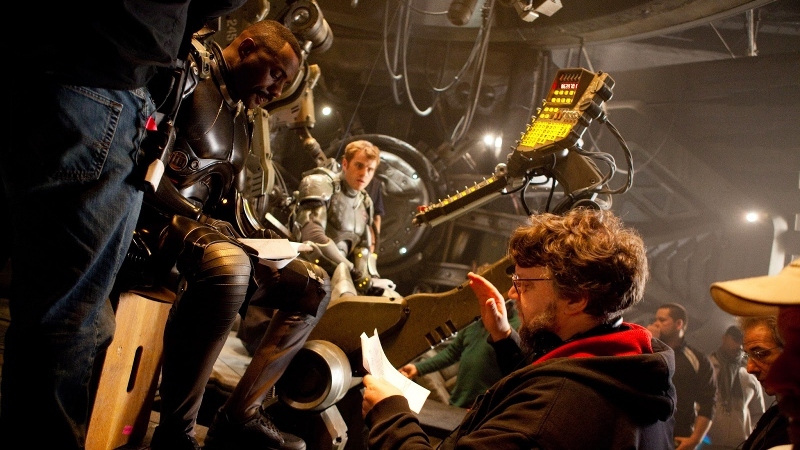 Pacific Rim's massive scope features some of the most eye-popping visual effects you've ever seen, the sound design is completely immersive and it's even got a few original ideas under the hood. Of course, its successful foreign box office run confirmed the sequel...but for the time being, it pretty much bombed around here. Of course, lukewarm box office numbers don't mean anything if you actually like a particular film. And I did...well, kind of like Pacific Rim, with a pretty big asterisk at the end. The film's PG-13 rating is somewhat misleading, as this big-budget rendition of "Rock 'Em Sock 'Em Robots" is actually aimed at 12 year-olds and those who can easily channel their inner pre-teen. Stuff does indeed blow up good: almost every dollar of its $190M budget is represented through eye-popping visuals, sleek effects and a convincing atmosphere. The film's sound design shares the same expansive scope as its sights, conveying enough weight to support untold metric tons of heroic Jaeger robots and sinister Kaiju life forms. On the whole, Pacific Rim is substantially more coherent, entertaining and worthwhile than Michael Bay's Transformers films, which it obviously owes part of its existence to. 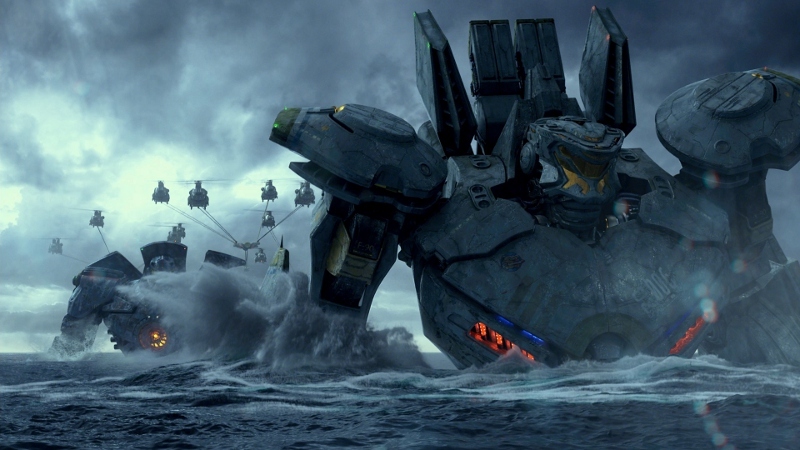 But make no mistake about it: Pacific Rim has no shortage of head-scratching drawbacks that prevent it from feeling like much more than a feature-length special effects highlight reel. You like goofball, cartoonish supporting characters? Pacific Rim's got you covered. They've got memorably bad names like "Stacker", "Herc", "Raleigh", "Hannibal" and "Yancy", but you'll probably remember most of them by their appearance or demeanor: there's "no-charisma brothers from Starship Troopers", "helium-voiced J.J. Abrams", "guy dressed like Orville Redenbacher", "British scientist caricature" and "token Asian chick" (with dyed hair, naturally! ), just to name a few. The film's paper-thin story takes way too long to pick up speed and the dialogue isn't anything to write home about. Military figure Stacker Pentecost (Idris Elba) even gives a third-act inspirational speech straight out of Independence Day...but I don't remember it all because I tuned out after the first few words. This is just a fraction of what bugged me about Pacific Rim, which often takes itself way more seriously than a big, loud, dumb "us vs. them" movie really ought to. Complaints aside, though, I actually did enjoy myself more often than not. Pacific Rim is meant to be seen on a large screen with good speakers, and preferably in the company of people who don't mind laughing at and with the strengths and drawbacks of popcorn flicks. 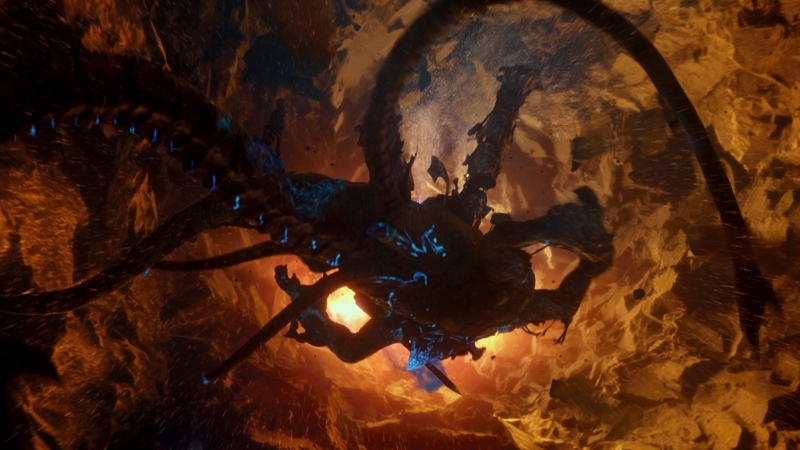 I'll undoubtedly return to Pacific Rim (or at least certain parts) every so often, as the film's visual strengths and oddball charm still manage to surpass some of its more glaring mistakes. Luckily, Warner Bros.' Blu-ray/DVD combo pack helps to tip the scales in its favor, serving up a pitch-perfect A/V presentation and a collection of entertaining, informative bonus features. It's not at all surprising, given the director's enthusiastic track record. Not surprisingly, this big-budget production looks fantastic on Blu-ray. This 1.78:1, 1080p transfer ever-so-slightly opens up the 1.85:1 theatrical matting, allowing plenty of room for the film's eye-catching visuals to shine through. Image detail is pitch-perfect, the film's stylized color palette looks accurate and digital eyesores are completely absent every step of the way. This was undoubtedly difficult source material to compress and transfer properly, but Warner Bros. has a solid track record of producing some of the finest looking Blu-rays on the market. Short of the optional Blu-ray 3-D release (available separately), I can't imagine a more technically proficient version of Pacific Rim on high-definition home video. All things considered, it's flawless from start to finish and fans will enjoy seeing how it holds up on the small screen. Surprisingly enough, Pacific Rim's audio is available in either 5.1 or 7.1 DTS-HD Master Audio, depending on your system capabilities. Obviously the two extra channels help to carry more of the film's hefty sonic presence, but either option is guaranteed to give your setup a good workout. Dialogue is crisp, channel separation is strong and the rear channels and subwoofer are seldom left out of the action. I was even tricked at least once (enough to do a double-take), which is always a good sign. Pacific Rim is truly one of the best-sounding Blu-rays I've heard to date, easily earning a perfect rating for both overall quality and the choice of two different mixes. Together, both the video and audio serve up consistent reference quality material, making Pacific Rim a reliable "demo disc". Lossy Dolby Digital 5.1 tracks are available in Spanish, French or Portuguese, as well as four sets of regular or SDH subtitles in the exact same languages. Presented in Warner Bros.' typical style, this interface is lacking in creativity but is at least easy to navigate and loads quickly. This three-disc release is housed in a dual-hubbed keepcase with stacked Blu-rays (what the?! ), a Digital Copy redemption insert and a matching slipcover. Overall, the presentation is nothing special but it gets the job done. There's plenty to dig through, but it's no surprise: Guillermo del Toro's back catalog has a great track record of well-produced supplements. Disc One leads off with a feature-length Audio Commentary with the director, who does an excellent job of dishing out plenty of details without coming across as stiff or condescending. Almost every tradition stage of production is covered in at least minor detail, including early preparation, the ambitious visuals, character design and development, script revisions and much, much more. It's a casual and informative track from start to finish and doesn't even make me wish for any more participants. On a related note, Disc One also includes a series of Focus Points (13 parts, 63 minutes total) with additional production featurettes detailing the visual design, set locations, costumes, CG effects, character backgrounds and more. In total, it's a fine group of extras on its own...but there's more to go! Disc Two continues with a Director's Notebook that includes six additional "Focus Point" featurettes and a variety of interviews, image galleries and personal notes. 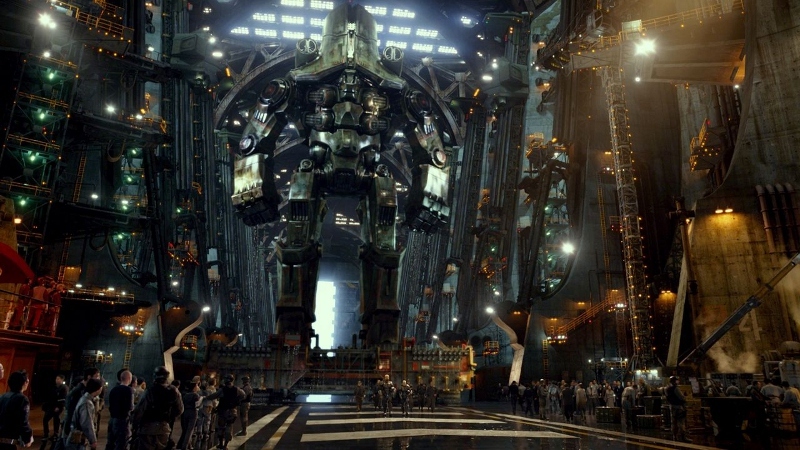 "The Digital Artistry of Pacific Rim" and "The Shatterdome" are two like-minded featurettes about the film's visual design, FX development and concept art. "Drift Space" breaks down a quartet of scenes from the main feature with characters bios, while four short Deleted Scenes are also included for your viewing enjoyment. Finally, we get a brief but entertaining Blooper Reel that includes a few amusing on-set outtakes. Aside from a more streamlined behind-the-scenes documentary---and, of course, a poster and/or trailer gallery---there's a solid amount of material here that fans will definitely enjoy. Optional subtitles are included for all applicable bonus features. I wanted to like Pacific Rim more than I actually did, but it's still a pretty good time at the movies. The action is solid and visual effects are obviously a highlight, yet most of the one-dimensional characters, cornball dialogue and pacing issues continuously keep it from being a more durable film. Bottom line: even if you're a pretty serious fan of Guillermo del Toro's work, that doesn't automatically mean you'll flip for Pacific Rim. With that said, Warner Bros.' Blu-ray combo pack swings for the fences, serving up a reference quality A/V presentation and a nice assortment of special features...and just a few short months after its theatrical run, too. It's Recommended for those who don't mind eye candy with extra cheese. Randy Miller III is an affable office monkey by day and film reviewer by night. He also does freelance design work and runs a website or two. In his free time, Randy also enjoys slacking off, juggling HD DVDs and writing in third person.